Do You Need Any Translation Services? We Provide Legal, Financial and Technical Translation; Arabic Translation Services and Translations for all World’s Major Languages. If you are looking for professional translation services, or if you need financial or technical translation in Arabic or other world’s major languages then you chose the right place. Dar Ibn Khaldoun for Translation and Media Production is a firm based in Amman, Jordan that provides a full range of translation services for law firms, commercial companies, banks, computer firms, e-training programs and a large variety of organizations and individuals from all sectors of the economy. Welcome to Dar Ibn Khaldun for Translation your accredited Translation Services in Amman Jordan. We are one of Jordan’s leading Translation Services in Amman offering the highest quality and most reliable Translation Services in Amman Jordan. Our team of highly skilled translators and interpreters cover a wide range of languages. We are concise, fast and totally reliable, delivering your much-needed documents on time. In light of many years of experience in the field, and working with clients from all sectors of the economy, we know well the importance of translation business. We, at Dar ibn Khaldun for Translation know that every error or syntax mistake could cause damage to the customer. We are placing at your disposal the best professionals who specialize in translating financial, business, legal, technical, and marketing documents; for example, orders of translating documents such as contracts, agreements and arrangements shall be made by Translation Services In Ammanversed also in the legal aspects in the destination country and source. However, Certified Document Translation in Jordan of financial statements of business plans, reports, estimations, and balance sheets will be done by professionals who hold in-depth knowledge in the field. Also, translation of Marketing documents like presentations, advertising materials, or Web sites, will be carried out by Certified Translator In Jordan that are able to deliver exactly the right message, and depending on the language current acceptable jargon that fits the target audience. We view the translation of documents as an important and integral part of the conduct of the modern world. In fact, in the global era, the need for translations arises in many different situations, and must be carried out in the best and most reliable way whether it is a marketing, business, legal, personal, academic or other goal. In our experience, a well-translated document serves its purpose accurately and to the customer’s full satisfaction. On the other hand, we encountered quite a few customers who tried to use the services of amateurs and were handicapped by the results. Therefore, we strongly recommend that you make translations only with real professionals as we do in our company. It should be understood that the term document translation includes a long list of goals, needs and materials, each of which constitutes an area in itself. For example, translation of legal documents refers, inter alia, to wills, death certificates, divorce and marriage, protocols, etc. All these require the translator not only to know about the two languages, but also to have an in-depth legal background, especially in the field of the document. Another example is the translation of business and marketing documents such as contracts, engagements, reports, advertising materials and presentations, or various financial statements. Here, too, the translator must be familiar with the cultural and linguistic nuances in both countries, and convey the messages, details and intentions in the document in an accurate, clear and flowing manner. Translation of laws, documents and contracts, companies’ articles of association, catalogues, specifications, operation and maintenance manuals, films and documentaries, books and researches for graduate students. We offer an accredited translation from Arabic to English and vice versa, in addition to translation for all languages for immigration documents including birth certificates, family books, land registration deeds, insurance policies, bills of lading, invoices, power of attorney, driving license, word processing, as well as applying computer programs, word, access, excel and graphic design. The importance of certified translation in the global era In recent decades the world has become a global village where companies and organizations have business relations with many parties abroad, whether partnerships, transactions, websites, clients in different countries or ordering products. Dar ibn Khaldun for Translation was set up by a professionally accredited and Certified Translator in Jordan, whose sole purpose was to fill the gap of quality translation services. This grew up over time to include Interpretation Services Jordan, and it then grew into a global presence with our successful website. Today, Dar ibn Khaldun for Translation is the leading accredited Arabic Translation Service in Jordan, we are leading the Translation Companies in Jordan with our quality service. We offer the most comprehensive Translation Services in Amman Jordan. We now employ a vast array of translators and interpreters, as an equal opportunity employer of men and women, with different backgrounds of professional, technical, academic and religious experience, from legal, financial, IT, political, religious, commercial, retail and other sectors. We work 24/7, we know that the world doesn’t stop, its morning in Amman and night in New York, you need an immediate response, a quick reply and to be sure that your needs are met, contact us any time and we will be ready to reply. Our service is a global, and as such the sun never sets on Dar ibn Khaldun for Translation ! Our company is based in Amman but our reach is all over Jordan; as through the internet we reach the world, and we are not limited in whom we work for and how far you are. Our Translation Services in Amman combined with our Arabic Translation Services Jordan are global; serving customers in Jordan and all over the world, our reach has made many satisfied customers in many countries. We offer exceptional rates and also discounts for registered returning customers. If you are in need of constant translation service, you will get a better price as we understand that Certified Document Translation Jordan on a constant basis can be expensive, so we acknowledge our returning customers with an even better service. Become a VIP customer and get the best prices possible. Don’t wait, ask us for a quote, we will surprise you with an exceptional price, amazing speed and an efficient service like no other. Translation research studies, contracts, catalogues, operating manuals, maintenance manuals, commercial agencies, invoices, bills of lading, insurance and medical reports and certificates. Interpretation We offer interpretation services through providing you with interpreters who accompany business delegations of all languages. We have qualified translators and interpreters to translate to and from the following languages: German, French, Russian, Ukrainian, Spanish, Italian, Romanian, Greek, Dutch, Bulgarian, Turkish, Chinese and Korean. Certified Document Translation Jordan, do you need legal translations, legally approved documents, notary certified, apostle stamped documents, contracts, and certificates for consular and foreign government requirements? Dar Ibn Khaldun offers you a comprehensive service that will cover all your legal, financial, and contractual needs. Amongst the languages we offer are German, Russian, French, Italian, Ukrainian, Spanish, Romanian, Chinese, Turkish, Greek, Dutch, Bulgarian and Korean. Interpreting Services Jordan offers you a personal service when visiting Jordan, or if you have visitors and need a translator we offer you Interpreters in Amman for a specific language to make your negotiations easy as well as Interpreting Services Jordan that will accompany you anywhere in Jordan. So, if you need German, Russian, French, Italian, Ukrainian, Spanish, Romanian, Chinese, Turkish, Greek, Dutch, Bulgarian or Korean, we will supply you with the appropriate interpreter to accompany you. With regards to films and documentaries, we offer the most comprehensive Arabic Translation Services Jordan. We will provide you with a full range of screen adapted translation files. We at Dar ibn Khaldun can translate into German, Russian, French, Italian, Ukrainian, Spanish, Romanian, Chinese, Turkish, Greek, Dutch, Bulgarian and Korean. In case you need to translate your website into German, Russian, French, Italian, Ukrainian, Spanish, Romanian, Chinese, Turkish, Greek, Dutch, Bulgarian or Korean? At Dar ibn Khaldun all your Translation Services In Amman are solved, you will have your web content in any language you desire. Scientific/peer review journals in English? You can send us your Arabic script and we will use our comprehensive Arabic Translation Services Jordan to ensure your manuscripts meet the peer review journal requirements, thus advancing your career. When it comes to translating technical documents such as specifications, manuals, maintenance instructions, patents and various guides, all professional terminology must be well understood in light of extensive experience in the field. At the same time, there are many other areas of translation that require specific skills, such as academic, accounting, television and entertainment, education, sports, real estate and construction, and all the rest are the best and most accurate solutions backed by many years of experience and thousands of documents that have already been translated for our clients. Are you an Immigrant, married a Jordanian? Perhaps a visiting student or professional? You need to provide legal documents and government forms to various government or academic departments to meet their requirements. Not a problem, we at Dar ibn Khaldun offer you a full range of Certified Document Translation Jordan. Our constant mission is to disable the demanding wishes of our clients and lawyers. For us it is no small satisfaction that we have several offices of lawyers who are regular clients of our legal translations. Our legal translations are done by lawyers who are also translators and by highly skilled translators. We handle all types of legal translations from simple documents to the most complex documents. We can get a notary certificate for each translation. Amongst our clients are world leading banks, financial institutions, government agencies, leading businessmen and companies, law firms and academic institutions. We at Dar ibn Khaldun are the leading Certified Translator in Jordan and our Translation Services in Amman Jordan Translation Services in Amman Jordan are considered the countries best. Dar Ibn Khaldun for Translation and Media Production translated during the period from March 2001 to March 2002 Jordan agreements with various countries of the world. Dar Ibn Khaldun for Translation has served many successful companies and individuals. Amongst our esteemed institutional customers are legal firms, hospitals, clinics, universities, colleges, corporations, and small businesses. Amongst our individual customers are physicians, professors, teachers, immigrants, business men, scientists, engineers, students and even tourists. Our accredited Translation Services in Amman Jordan is considered to be one of the best Translation Companies in Jordan. Visitors to Jordan have claimed that our Interpreting Services Jordan was the best they have had with the most courteous interpreters that helped beyond their call of duty. HRG, MWH, Norwegian Refugee Council, Isra University, Ferring Pharmaceuticals, MGI, MMDS, Samarah, USAID, Hikma, FAO, Middle East Insurance Company, Al Ahsa Chamber, Ministry of Municipal Affairs, Arab Jordan Investment Bank, Jormat Group, GroFin, Its Learning Info2cell, Swisslog, Bank Al Etihad, O&M Engicon, Jordan Customs, Maersc, Pepsi, LG, APL, Idiom Express, Watania, Samsung, Aspen, UN Women, ConsultUS, ME Law, Middle Solution, Jordan GBC, Bank of Jordan, Oxfam, Novartis, International Beverages Consultancy, World Vision, Zarqa University, Pharma International, MIG Bank, The Jordan Hashemite Fund for Children’s Development. Our services included Certified Document Translation Jordan and Translation Services in Amman as well as Interpreters In Amman. We offer our services in German, French, Russian, Ukrainian, Spanish, Italian, Romanian, Greek, Dutch, Bulgarian, Turkish, Chinese and Korean, to the great satisfaction of all our customers, many of whom are returning customers. 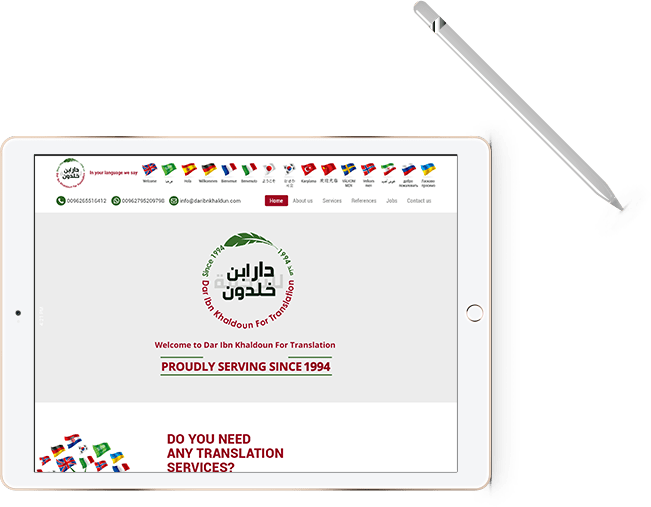 Dear customer, thank you for reaching this page, this means you want the best Translation Services in Amman Jordan and Dar Ibn Khaldun for Translation is the best Arabic Translation Services in Jordan can offer. Therefore, we offer you the following contact details; please let us know your needs and attach any documents you need for a full quote. Also, if you desire any extra services such as a notarized copy, apostilized or other certification, we will quote accordingly. Are you familiar with two or more languages? Do you speak or are knowledgeable in any of the following: German, French, Russian, Ukrainian, Spanish, Italian, Romanian, Greek, Dutch, Bulgarian, Turkish, Mandarin Chinese, Cantonese Chinese, Japanese, Urdu, Korean, Portuguese, Polish, Swedish, Norwegian, Danish, Dutch? Maybe you speak a language not mentioned here. Can you translate from and to Arabic with ease? Can you interpret immediately without stammering? Do you want to earn more income or add to your income? Are you a professional with some extra time? Perhaps you are unemployed but have expert knowledge of common and unusual languages. If you are, then you must come to us and become an accredited and Certified Translator In Jordan or an Interpreter in Jordan. 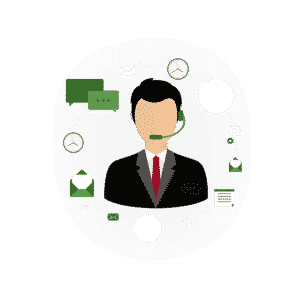 As an interpreter, you will be paired with an employer that will also broaden your horizons, you will be privy to private information so you must be totally trustworthy, at the same time you might get to travel around if your employer is a businessman or tourist seeking special requirements. At Dar Ibn Khaldun for Translation you get a doorway to an amazing new world, widening your social interaction as an interpreter or just increasing your daily income as a Certified Translator in Jordan. So, don’t waste time, contact us now with our online form or via e-mail, tell us what languages you are proficient or even fluent at and what is your academic and professional background. Together we will build a portfolio for you to maintain.